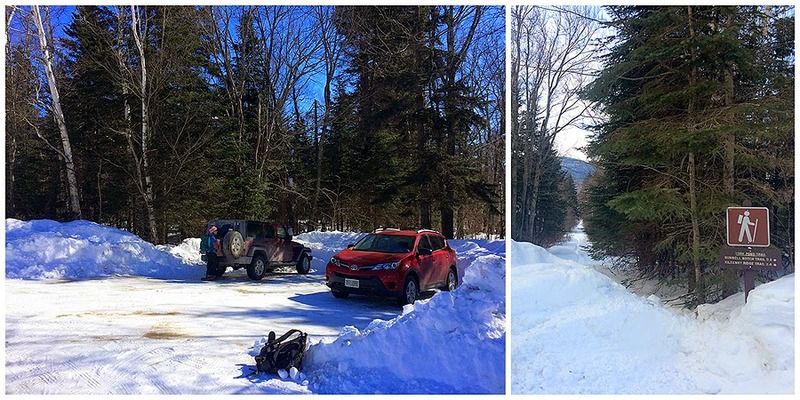 - Cabot, it's in the middle of nowhere and takes forever to drive to, made worse since the lower end of the Mount Cabot Trail has been closed since 2000 by an old crotchety homeowner, word is he spends his days yelling at clouds (click here for file photo). 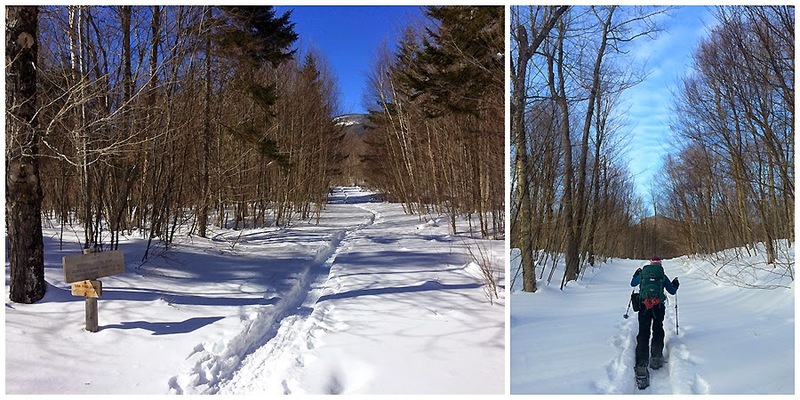 Anyway, in the past (2010, 2012) I have hiked the closed Mount Cabot Trail but in the winter it's usually not broken out and it's best to head in from the Berlin Fish Hatchery, which is located about a half mile from the Canadian border (just kidding). 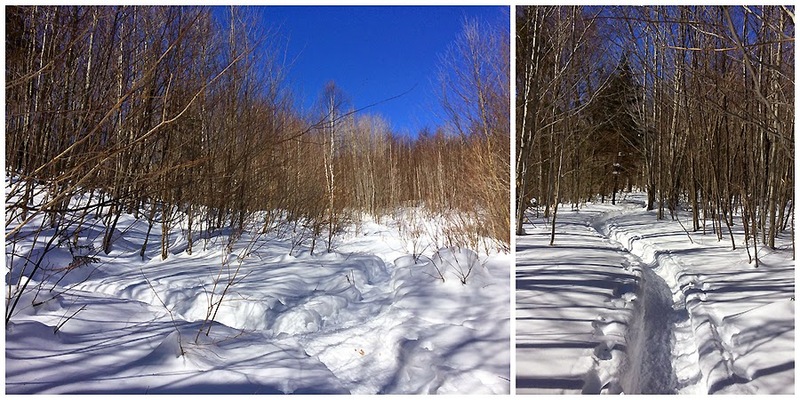 Even though the trail is twice as long as the Mount Cabot Trail approach, it is a nice little hike with easy to moderate grades. 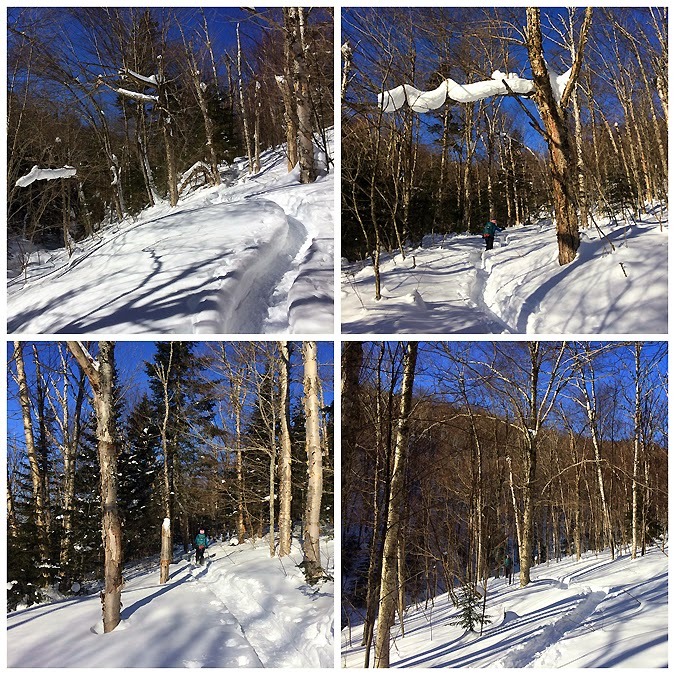 - Whitney and I got an early start and made great time over the perfectly packed down snowshoe trail. 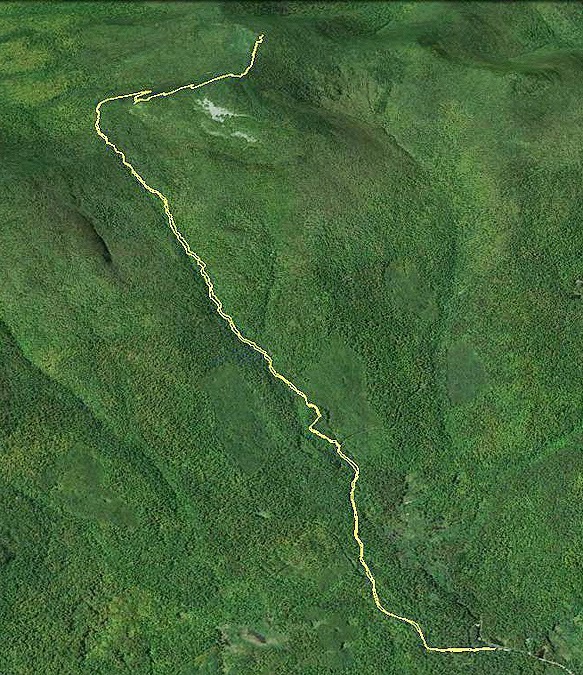 The first mile is relatively flat as it heads over an old logging road with a nice partial view at times of Cabot and the Kilkenny Ridge. 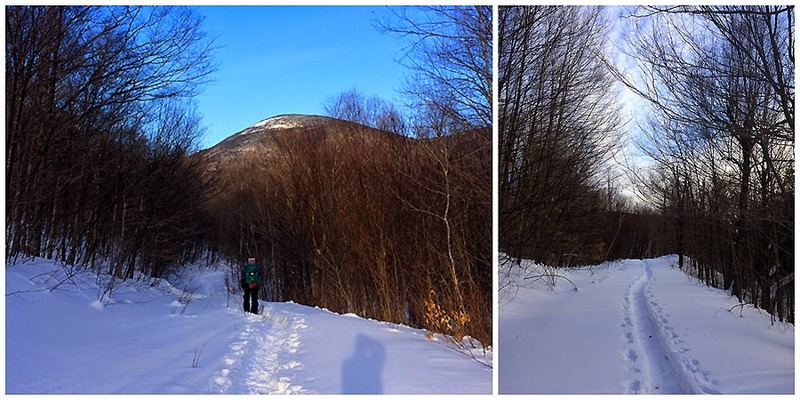 After a mile the trail bangs a left off the logging road and meanders for a mile and a half through open hard woods as it ascends close by Bunnell Notch Brook before heading into a dense pine forest until reaching the junction with the Kilkenny Ridge Trail. 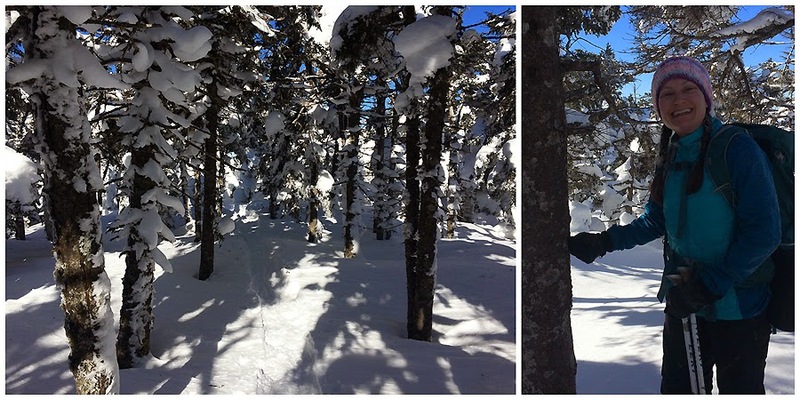 - The Kilkenny Ridge Trail heads into an open small Birch glade before heading back into the pine forest where it passes by the trail junction for the closed Mount Cabot Trail. 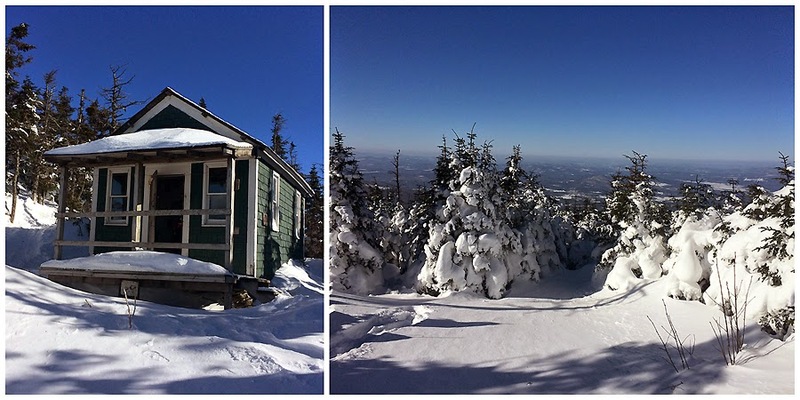 From here the trail gets steeper as it curves around and up past Bunnell Rock and eventually gains the ridge at the Cabot Cabin just below a clearing at the site of the old fire tower which some confuse as the summit, the summit is another 0.4 miles north. 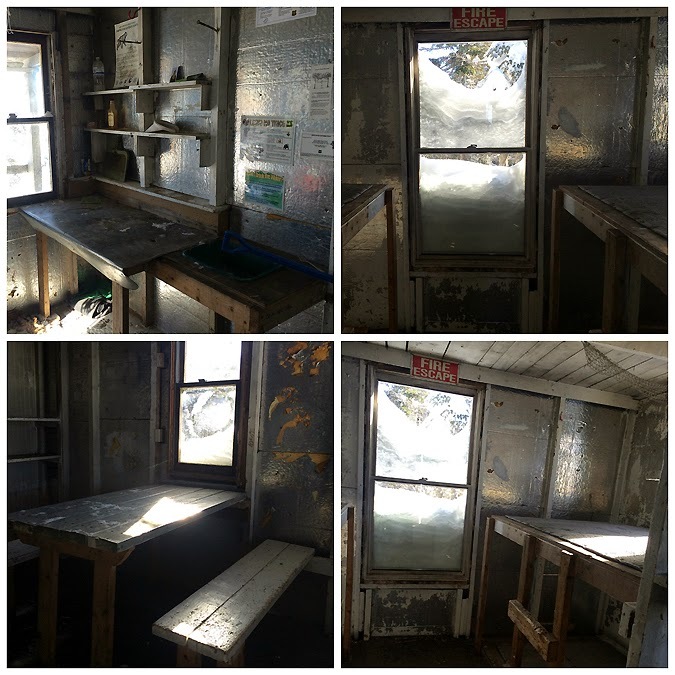 - Whitney and I took a short break in the Cabot Cabin, which if I had to guess is in the same shape as a local meth lab, needless to say we didn't stay long before making our way up to the summit. 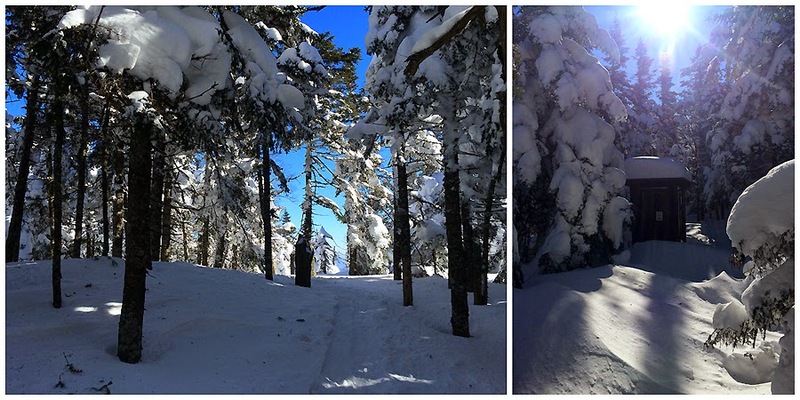 The last 0.4 miles to the summit is a gradual climb, it's not tough at all but if the trail wasn't broken out for us it would be difficult to stay on the trail as it looks like it could become a maze around the pine trees through this section. 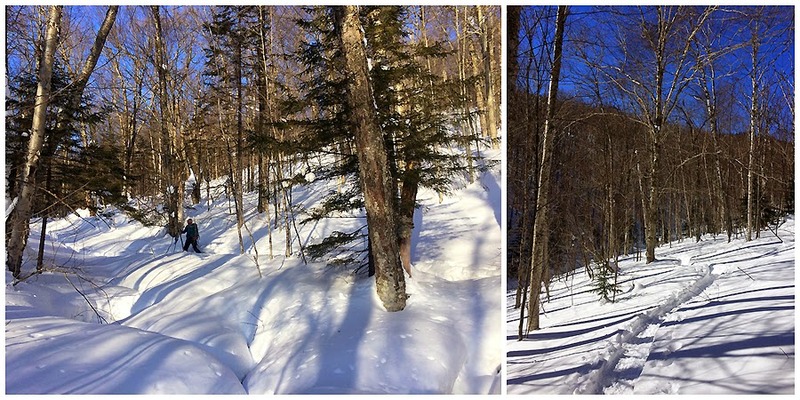 - The summit of Cabot is wooded and not too exciting. 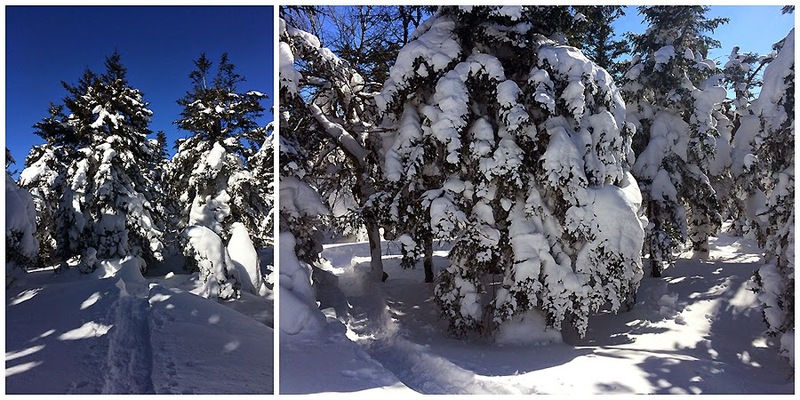 There used to be a sign that said Mount Cabot with the elevation on it, plus another small sign nailed to the back of a tree fifty feet away at the true summit. However, some jerk stole both signs, boo! 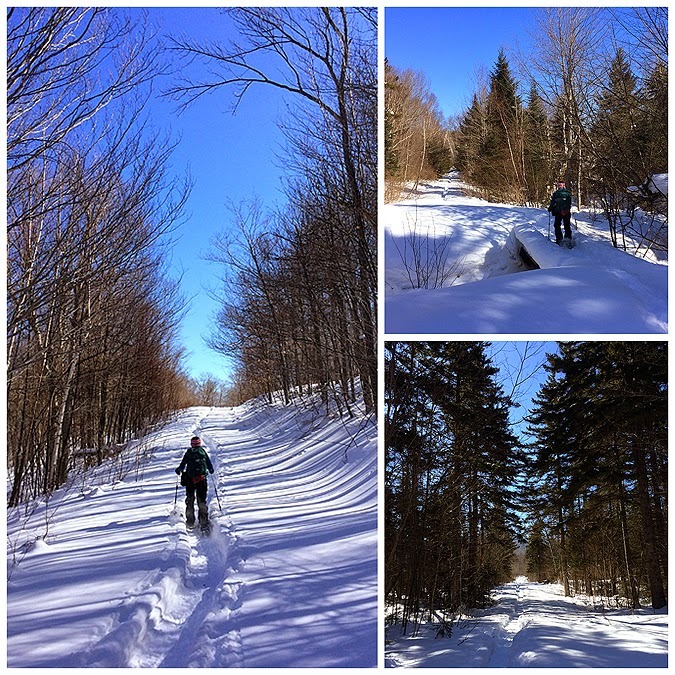 - The hike back out was great, we took in the views from Bunnell Rock, enjoyed the descent along the brook through the open hardwoods, and spied some recent moose activity along the logging road making it back to the car before noon, and all under bluebird skies! 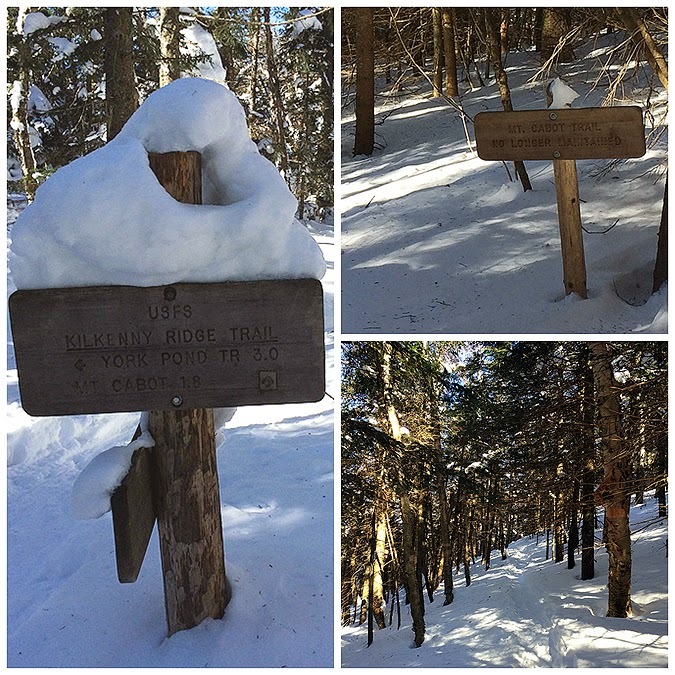 - This hike got Whitney closer to her single season winter completion (39 of 48). 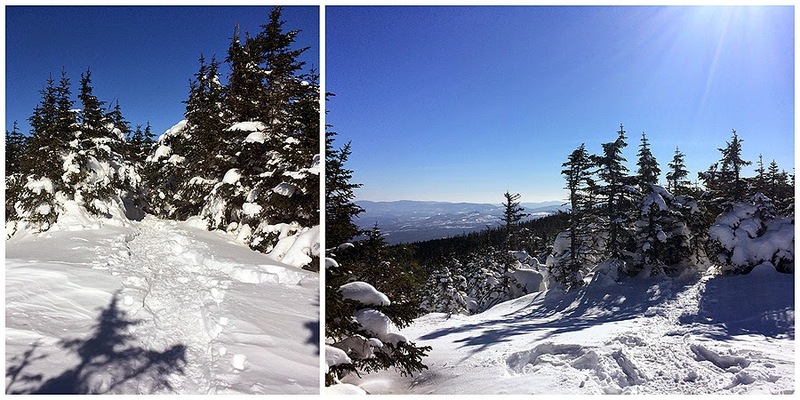 For me it was the completion of my second winter round and sixth overall round of the 48 - 4000 footers, with only Whiteface and Cabot again before I complete my seventh round. Not a bad way to start the weekend! 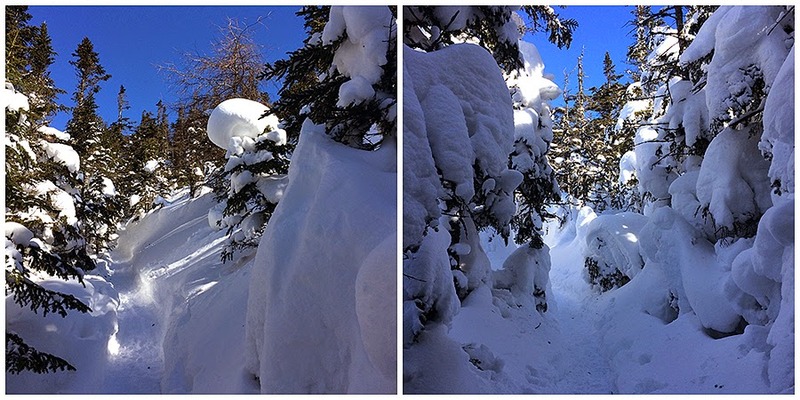 Deep snow above 4,000 feet! 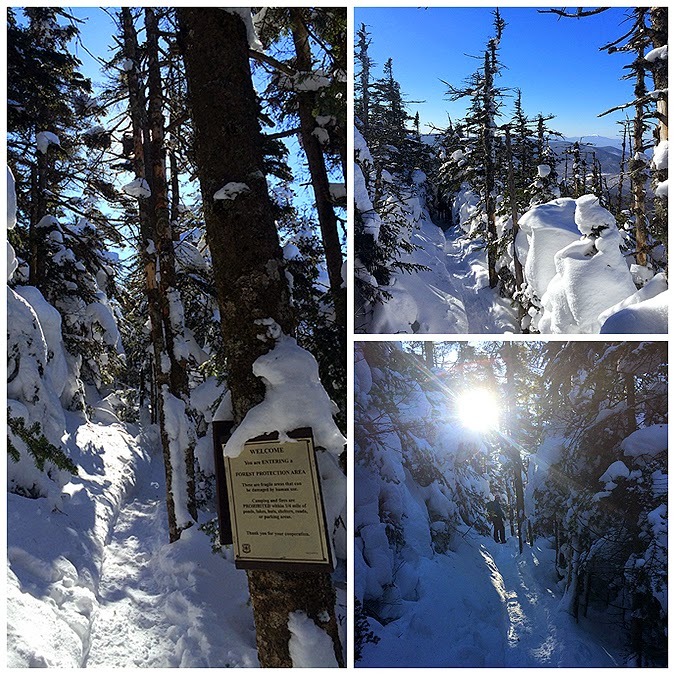 The trail gains the ridge...at the outhouse! Inside Cabot Cabin, it's a little dingy in there! Love the report, hysterical, great pics too! Thanks for all the great info! Planning to hike it this weekend as an overnight. Is there still a wood stove in the cabin? Hi Sara, glad you found the trip report useful. There is no wood stove in the cabin. As you can see from one of the pictures above there is not a lot to the cabin. You walk in and immediately on the right is a table and a bench to sit at, on the immediate left is a counter, and straight ahead are four tiny places to sleep. Have a fun weekend up on Cabot!